I couldn’t resist the temptation and I bought Nanoil Hair Oil. It has been advertised almost everywhere and I’ve read so many positive opinions so I finally decided it’s going to be mine. I ordered it a few weeks ago but I wanted to test it thoroughly before posting my opinion. Hence the review gathers the most essential information regarding the effects of oil treatment. I was looking for a natural blend of essential oils for my hair for a long time. I have already oiled my hair with natural oils, among which my favourites are Maracuja oil, and Sweet Almond oil (which I love to apply to my face as well). Unfortunately, the search for ready-made hair oils seemed pointless. I was searching for natural products among hundreds of cosmetic mistakes … until I found one! Eureka! I would like to present Nanoil Hair Oil – it is not only full of natural oils in the composition but also it is not overwhelmed with silicones and is free of various synthetics. It would be best if I start with a short presentation of the product, using the information from the website (www.nanoil.co.uk). I would also like to encourage you to read the information in detail – they describe it wonderfully. a natural and safe formula free of parabens and silicones, designed for hair with different structure – porosity. Nanoil For Medium Porosity Hair: for weak, dull and frizzy hair. Which of the tree versions should you choose for yourself? P.S. As far as I know, if you want to examine the porosity of your hair it is best to do it at a trichologists or hairdressers where they have a microscope and can see the condition of the hair in close up. At first, I started using Nanoil For Medium Porosity Hair, because that’s how it was classified after the porosity test. 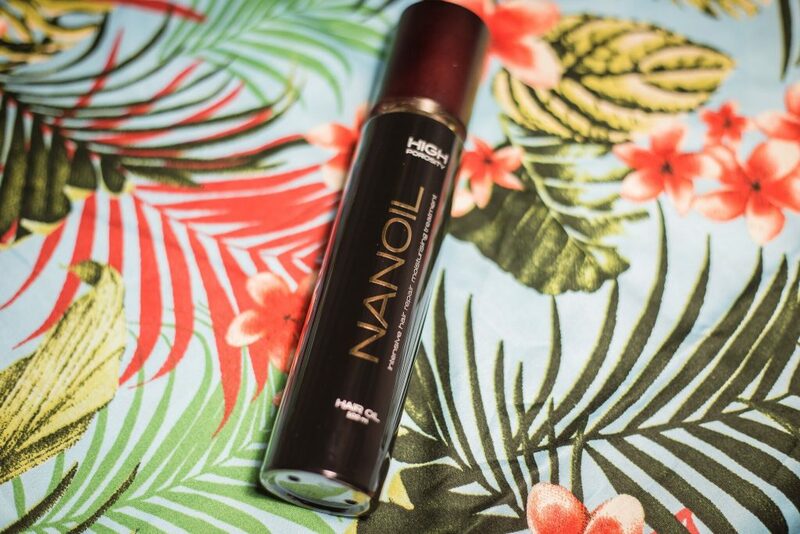 In this version of Nanoil, there are six natural oils: Argan, Macadamia, Marula, Jojoba, Maracuja and Coconut. I was afraid of the last one because it was able to tangle my hair. The product is completely natural, but aside from the oils, there is also place for silk, UV filters, vitamins A + E, sprout extracts and growth stimulants. Really NO silicones, preservatives and allergens. Nanoil For Medium Porosity Hair worked best on my hair when applied to the full length and rubbed into the scalp before washing and then thoroughly rinsed. After applying Nanoil Hair Oil the strands were silky smooth, though after rinsing, the effect was weaker. This is an effectively nourishing hair oil, but in my case it did not give the ‘wow’ effect. It was not suitable for my hair, especially when I applied it to damp hair before drying, even though I used the minimum amount. It is very difficult to determine the hair porosity and the products have to be selected carefully selected. As a second, I started using Nanoil For High Porosity Hair which turned out to be the perfect product for me. It also contains six natural oils, but has a slightly different composition that suits my hair, probably also because Coconut oil was not added. In this version, we have the following oils: Almond, Argan, Evening Primrose, Avocado, Maracuja, Cotton Seed. There are two natural hair oils that I love to use solo. Additionally, there are growth stimulants, shoot extracts, keratin, panthenol, UV filter, silk, lanolin and vitamin E – a wealth of additional nutrients. And here again we get a formula WITHOUT silicone, paraben, alcohol, preservatives and other harmful substances. No wonder Nanoil Hair Oil worked better on my hair this time. I had the feeling that my hair needed a more intensive regenerative treatment. This version can be applied overnight, to dry or wet hair, before or after washing, or, whenever you want to add a bit of shine and softness to the hair. Of course, I adjust the portions used to the minimum necessary to work effectively. Thus I do not weigh down my hair. This way, the oil will last longer. What about the hair? Since I use Nanoil For High Porosity Hair, the strands are beautiful, very smooth and shiny. No more problems with running my fingers through it. My struggle with frizzy and unruly curls as well as thinning is finally over. No other hair oil worked so well for me, especially only after a few uses! I’m very positively surprised.